"Given the investments being made, success for cloud migration service providers will depend on their venues being destinations - not only for new application deployments, but for the re-platforming of existing applications and servers. This is the opportunity RiverMeadow is targeting, and the company is making what appears to be solid progress in its OEM and partner progams." 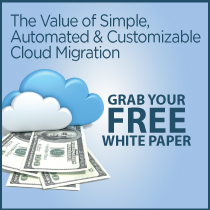 "Businesses are motivated to leverage a cloud solutions consumption model, but also want to mitigate the costs associated with workload migrations and cloud onboarding tasks that consume IT staff time. RiverMeadow offers a cloud service to migrate workloads from a source to a target via a software-as-a-service (SaaS) model that automates cloud migration at scale. RiverMeadow’s heterogeneity, scalability, and automation capabilities position them well to streamline migration in an elastic IT world, in which businesses are embracing cloud platforms and moving out of a static IT environment. " "Cloud mobility platforms like RiverMeadow Software take advantage of the APIs that cloud service-providers expose. By effectively tapping into the APIs offered by hypervisors to the public-cloud providers, cloud mobility automates provisioning, configuration, and integration with the underlying platforms. Automation brings the private-cloud platforms and public-cloud offerings to the same level playing field. " "Secure direct migration is RiverMeadow Software's direction of travel. Until now, it has worked by staging application migration through its own cloud, collecting, converting and then sending back the VMs/images. Enterprises want to keep data, workloads and applications behind their own firewalls. They don't want to use migration services in a SaaS model that require staging apps and data via a third-party hosted service. RiverMeadow is supporting this requirement with a new point-to-point migration function – and has won significant new backing for its approach. " "Onboarding is the elephant in the corner of the cloud – templates only take you so far up the stack, and the rest of the workload is manually configured, fragile and messy. You can try to repurpose high-availability and backup tools, but good luck with that. Most aren't virtualization-aware. This, in a nutshell, is the problem that fresh-out-of-stealth RiverMeadow Software hopes to solve with its enCloud SaaS." "If you missed VMworld in San Francisco this week, no worries, my colleague Barb Darrow captured the key announcements and general sentiment on what's up with VMware. This gave me the chance to walk the expo floor and check out other companies doing cool stuff. There were five that stood out..."
"Adding RiverMeadow to our solutions portfolio strengthens our leading position in the cloud market and provides our solution provider community with a tool to automate the migration of applications into the cloud."